A Poulan Pro Chainsaw will give you the best of both worlds — a heavy-duty working saw at an affordable price. And, you might be surprised to learn that Poulan Pro is owned by Husqvarna so many of the components are shared between chainsaws, which basically means you get a high-quality chainsaw but much cheaper than a Husqvarna. Not only do we review many of the best Poulan Pro chainsaws but we also give you some important facts so you can decide which chainsaw is right for you. Today, we all know Poulan tools as being reliable, affordable and really great to use. This did not happen by accident. The Poulan Saw Company has a rich history, going back more than half a century. How the company came to be and their subsequent development into producing fantastic consumer products that have been depended upon by several generations is worth considering. Who understands a chainsaw better than a lumberjack? After many years cutting down trees for a living, Claude Poulan put his experience to good use. In 1946, he developed his first professional chainsaw and the legacy of the Poulan Saw Company became etched into history. Manufacturing quality chainsaws for the professional lumberjack in his hometown of Shreveport, Louisiana, Poulan’s first models were two-man machines. These were so large and heavy, that it required two men to operate them. Through the 1950’s Poulan built up a reputation for building powerful, fast, and durable one-man chainsaws for professional loggers. By the 1970’s Poulan realized the value in producing lightweight chainsaws for the consumer market. These machines embodied the same quality standards and durability that went into producing chainsaws for the professional lumberjack. It’s just that now they also focused on the needs of the average Joe – people like you and me. Poulan chainsaws that are built for the home or non-professional user have been developed so that they are easier to use and offer great safety, easy starting and are much easier to handle than large, heavy, professional machines. Poulan light to medium duty chainsaws are also cheaper than the heavy-duty machines used by professionals. Since then, they’ve started producing a full range of garden tool products – all with the emphasis on affordable quality. Keeping up with the demands of the modern consumer requires constant research and development. Today, many of us are turning toward battery powered- tools. Battery power offers convenience, no emissions, and easy starting. Developing battery tools that are equal to the task of gas machines, has been a challenge that the guys at Poulan have embraced and mastered. They offer outstanding battery machines that continue the Poulan legacy of providing professional grade tools to the general public. In this review, we’ll look at a few of the best Poulan chainsaws – both gas and battery-powered machines. If you’re looking for a small, affordable chainsaw or want something larger and more powerful, you’ll find a Poulan Chainsaw that’s going meet your needs. Take a look at these products and you’ll see why Poulan has earned such a great reputation. It’s not easy to find chainsaws that offer this level of quality at a price that makes them affordable for most of us. Well-balanced and powerful enough for most homeowners. Many of you might not know this, but Poulan Pro and Husqvarna are the same company. This is really good news for us, as these are both among the most respected chainsaw manufacturers and the combined force of these two industry giants has made for a formidable competitor in the chainsaw market. Some of the components on the Poulan Pro PR5020 are shared with other Husqvarna models, this includes the highly durable 51cc, two-stroke engine. When developing the new Poulan Pro PR5020, the company has made a great effort in eliminating all the complaints of the previous model. So, they’ve reverted back to the manual adjustment for tensioning the chain. This means using a wrench to tension the chain, but the mechanism is much more durable. They’ve come up with a handy storage solution for the tensioning wrench – it clips into the back of the machine. This means that the wrench is always with you, making it very little trouble to adjust the chain tension. Easy to start and economical to run. The 51cc 2-stroke engine on the Poulan Pro 5020 is one of the best, I know this from reviewing the Husqvarna with the same engine. Some of the names for their unique technology is different under the Poulan banner, but they are the same. One of the most fantastic technological developments that have gone into the engine design is the effective air cleaning system that removes most of the sawdust and debris from the air intake before it reaches the air filter. This reduces the bane of chainsaw usage, you don’t have to constantly clean the air filter and it lasts longer. Soft-start as well as “purge and integrated” choke/stop controls, make the Poulan Pro PR5020 one of the easiest machines to start. For those who don’t know what purge means in this context, this is a bulb pump that allows you to pump the fuel through using a simple flexible bulb that you press with your thumb. The purge ball will remove all the air from the fuel and fill the carb float with fuel, this will help the engine start without pulling on the recoil starter to get the fuel through. This OxyPower engine is incredibly fuel efficient, lightweight and has just about the lowest emission ratings for any chainsaw. The machine weighs only 10 LBS (without the bar and chain) and emission levels comply with the strictest international standards. Whilst researching the product, I went through countless customer reviews, complaints, and general user experiences. I was surprised to see a number of complaints about engine starting problems. Generally, people have raved about this engine. So I wanted to know why some have found it difficult to start, especially since this is one of the big plus factors to this engine’s design. I found a clever guy who certainly knows his stuff and his explanation makes perfect sense. It’s likely that you may experience some starting problems when the machine is brand new. Before the engine runs in completely, the rings are seated very tightly. This is actually a good thing in the long run and these engines are renowned for durability. Remember that because this is a two-stroke engine, your lubrication is mixed with your fuel. Now, with these tight rings and very high compression, it’s going run lean at first. A lean burning engine is going to get hot – much hotter than when the fuel to air ratio is at its optimum. Because of this, the fuel in the carburetor will vaporize when the engine is switched off, hence requiring extra pulling on the recoil starter when you restart the engine. If the engine hasn’t cooled down sufficiently, the fuel will continue to evaporate and you won’t have any luck starting it. The good news is that this problem is only temporary, once the engine has run for long enough, the rings will wear into position and seat perfectly. Just give it enough time and the engine on the Poulan Pro PR5020 will start perfectly (even in cold weather) and keep delivering optimum power for many years. This is an incredible engine, so don’t be put off by complaints made by people who don’t fully understand the reason why they’re experiencing the problem. A less common complaint, but still worthy of some attention, is that of the bar chain. At first, this surprised me because the 20” bar and chain fitted to the Poulan Pro PR5020 is manufactured by Oregon and these are found on most top-rated chainsaws. The answer lies in the finer details. The 20” 70-link, low-kickback Oregon Vanguard bar and chain that comes standard on the Poulan Pro PR5020 is supplied as an economical option for light to medium duty. For most of us, this is fine, cutting firewood and removing branches doesn’t require a heavy-duty chain. This explains why it’s not a common complaint. How many of us are actually going to be using the Poulan Pro PR5020 to cut down large hardwood trees on a regular basis? If you’re going to be using this chainsaw for heavy-duty work, the standard bar and chain won’t perform as well and will need sharpening more frequently. In that case, you’ll want to fit the Oregon 72LGX070G. This is also a low-kickback 20” bar with a 70-link chain but is a professional-grade alternative. For most home users, the savings of using the Vanguard chain, supplied with the Poulan Pro PR5020 makes better sense. Why pay more for something that you don’t need? Okay, having covered those technicalities, let’s get down to the nitty-gritty. What is the Poulan Pro PR5020 like to use? In a nutshell – fantastic. I’ve already mentioned how lightweight the machine is and that’s just the start of it. The handles are excellent, with extra-thick padding, making them more than just regular soft grip handles. Together with the smooth-running engine, the Poulan Pro PR5020 has very low levels of vibration. You won’t feel much strain when using this chainsaw for long periods of time. The chain guard is very well positioned and has an easy right-hand operation to activate the chain brake. The chain brake also has inertia activation for added safety. Maintenance is also made very easy with clips on the side cover that give you instant access to the air filter and spark plug. The powerful engine runs at 9000 RPM with the throttle fully opened, giving you all the power that you’ll need to get through any situation easily. Though a gas chainsaw is a fairly noisy beast, the Poulan Pro PR5020 is one of the quietest machines that you’ll find – another advantage of that fantastic engine. It’s a tough little chainsaw that’s super-easy to use and has the advantage of automatic chain lubrication with variable oil flow. You can adjust the chain lubrication for your working conditions. If you’ve been shopping around for a high-quality 20” gas chainsaw, you’ll know what great value you’re getting with the Poulan Pro PR5020. Cheaper than the Husqvarna equivalent, the Poulan Pro PR5020 offers many of the same features – with exactly the same engine. This is exceptional value for money. A 2-year warranty and the Poulan reputation for affordable quality are good reasons why you would want to consider the Poulan Pro PR5020 as a fantastic buy. When it comes to overall value vs performance this Poulan Pro chainsaw is an excellent value for most homeowners. If you’re a lumberjack this isn’t for you, but your already know that. Most homeowners want an affordable chainsaw that is reliable and safe to use and Poulan Pro PR5020 meets those requirements. Quiet, no fumes, quick start & no maintenance. Automatic Oiler keeps your chain lubricated at all times. ✓ View or download the MANUAL for the Poulan Pro PPB4014. I know there are a lot of people who really can’t stand the hassles of using a gas chainsaw. Yes, they are very powerful machines, but gas chainsaws need gas and oil. They need regular maintenance and require some elbow grease to get started. They are also quite noisy. Battery-powered chainsaws are very popular because they are just much less hassle than gas. Yet, they still give you the versatility that comes with cordless operation. You can use them anywhere and they start with the touch of a button. The Poulan Pro PPB4014 is a battery-powered chainsaw that matches up well to smaller gas machines. It has a 14” bar and chain and uses a 40V lithium-ion battery. You have a choice of either 2AH or 4AH variants of this powerful battery. The very efficient, brushless motor will give you an extended working time when compared to many similar sized battery chainsaws. This battery is used in quite a few other Poulan battery-powered garden tools, meaning that you can use the same battery for all of them. The battery also has LED charge indicators to help you monitor the battery level. It has automatic chain lubrication and the oil reservoir has an easy-view window, so you’re always aware of the oil level. The Chain guard is excellent and the electronic chain brake has an audible warning – great safety features. A safety on/off switch also protects you against accidental starting and the machine will switch off completely when you release the trigger – this improves battery time and safety. The Poulan Pro PPB4014 is a very safe and easy chainsaw to use, ideal for people who are too great when it comes to technical details. The 14” bar means that you’re limited to smaller cutting jobs. Though 14” is not particularly large, for a battery chainsaw, this is a very good length. It will perform perfectly well on trees and branches with a 6”-8” diameter. You can tackle larger jobs, perhaps up to 12” diameter trees. Though if you’re going to push this little machine to that level, it’s going to take some time and you might run out of battery-power before you’re through. Ergonomic design makes it comfortable to hold while working. Of course, having extra batteries will prevent this from being a problem. If you try to push the Poulan Pro PPB4014 too much when cutting through thick pieces (or wood that’s particularly hard), the motor will, very likely, go into overload in which case, the electronic safety cut-off will kick in, so as to prevent damage to the motor. This isn’t really a problem, you just have to work slower when doing heavier work – you can’t force the saw to move faster by adding extra pressure on bar and chain. So if you’re looking for a very affordable battery chainsaw that is up to the task of most garden requirements, the Poulan Pro PPB4014 is the ideal tool for you. It offers you excellent quality and a great deal of power for a mid-sized battery chainsaw. Ideal for storm clean-up and cutting firewood. ✓ View or download the MANUAL for the Poulan Pro PR4016. The Poulan Pro PR4016 is very similar to the Poulan Pro PR5020. It’s smaller with a 14” bar and chain. You can tell the bar length of Poulan chainsaws by the last two digits of the model number. This one ends on 14 and this tells you that it has a 14” bar. Less power is needed to drive the shorter chain and so the Poulan Pro PR4016 uses a 40cc 2-stroke OxyPower engine. Like the larger 50cc engine, this one also utilizes the SuperClean air filtration system. So the Poulan Pro PR4016 won’t require cleaning or replacement of the air filter as often as most other gas chainsaws. Cleaner air also prolongs engine life. The Poulan Pro PR4016 is just as easy to start, it has a spring assisted recoil starter and also has the purge bulb to prime the fuel supply before starting. Designed with anti-vibration to reduce vibration to your hands & arms. Lightweight and easy to use, the Poulan Pro PR4016 weighs only 13 LBS. The soft grip handles are well positioned and, though the padding on the handle is not as impressive as the larger model, it’s still very comfortable to use. Being a smaller machine, you don’t really need as much effort to use it. Vibration is not very noticeable. Anyone who’s used a chainsaw for a lengthy period will know how important this is. The Poulan Pro PR4016 has automatic chain lubrication with a window that allows you to view the oil level while you’re working. It also has the innovative storage position for the chain tensioning wrench. It clips into the back of the rear handle and is, therefore, always accessible and won’t get lost. Very affordable and incredibly robust, the Poulan Pro PR4016 is ideal for cleaning up trees around your yard and cutting firewood. It’s considered to be a light to medium duty chainsaw which is what most non-professional users are looking for. It’s designed and built to a high standard without pushing the cost up with a heavy-duty bar and chain. Of course, if you want to push the Poulan Pro PR4016 harder, you can fit a heavy-duty bar and chain. Though, I doubt this would be necessary if you’re going to be using it for ordinary garden clean-up jobs and cutting firewood. Excellent gas chainsaw for small cutting task around the house. As you can see by the last two digits of the model number, the Poulan Pro PR4218 is an 18” gas chainsaw. To this end, it’s rated as a medium duty chainsaw and is the ideal tool for homeowners who want to cut small to medium trees, remove branches and cut firewood. 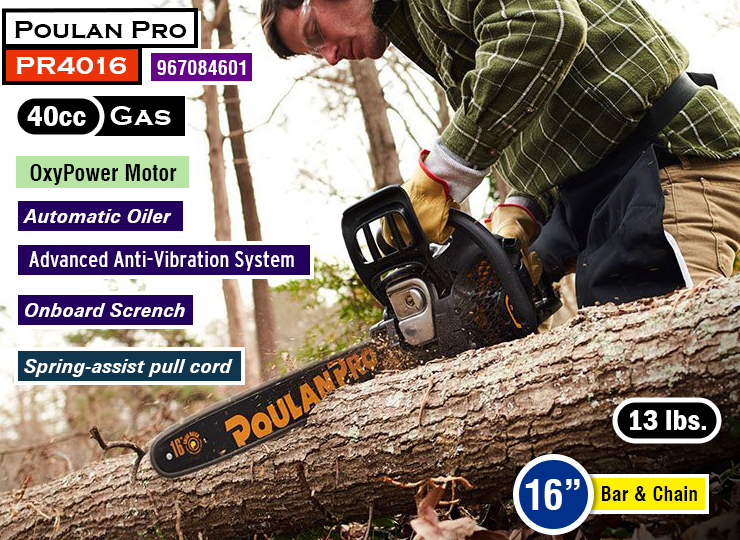 Like the other Poulan Pro chainsaws, the PR4218 uses their OxyPower engine. So this means the same low emission levels, great fuel consumption, and exceptional power. The 42cc, 2-stroke engine used on the Poulan Pro PR4218 provides all the power that you’ll need. It has the same SuperClean air intake system that is found on the other Poulan Pro chainsaws. Spring-assist pull cord combined with easy-to-use purge bulb. Really great, soft grip handles means very low vibration levels and a weight of 13.25 LBS gives the Poulan Pro PR4218 an excellent power to mass ratio. It’s also super easy to start – another common feature on all the Poulan Pro chainsaws. It has exactly the same wrench storage position as the others and also has the same automatic chain lubrication system. So, this is another really great Poulan chainsaw. It offers the same features as the others and is also really great value for money. There are a few facts that remain the same, regardless of which Poulan Pro chainsaw you choose to buy. All their gas-powered chainsaws have incredibly fuel-efficient engines with class-leading emission levels. They are all designed to be exceptionally comfortable to use and you won’t feel the vibrations that plague so many gas chainsaws. I really like the cyclonic SuperClean air intake that is also found the Husqvarna machines – it’s exactly the same design. Clogged air filters are the number one problem with chainsaws and this system really makes your life easier. Not only will you be wasting less time, constantly cleaning out the air filter, but the cleaner air going into your carb will improve engine life, improve engine performance and make it burn cleaner. As far as the battery-powered chainsaw in this review, the Poulan Pro PB4014 remains true to the Poulan philosophy of providing excellent quality at a reasonable price. As one of the larger battery-powered chainsaw available, it gives the ability to perform tasks that many other battery chainsaws won’t accomplish. Poulan chainsaws have been around for quite a while and the brand has a solid reputation. Since they’ve joined up with Husqvarna, the joint effort by both companies means that you have the benefit of some of the best R & D in the chainsaw business. Well, not just chainsaws but a wide variety of powerful gardening tools. Even though Poulan chainsaws share a lot of the same technology as their Husqvarna cousins, they tend to be a lot cheaper. This makes the Poulan Pro range of chainsaws excellent value for money. Poulan Pro can, therefore, be considered just about the best name in chainsaws for the light to medium duty chainsaw market – making them very popular with homeowners, who are looking for a machine that’s durable, easy to use, and won’t break the bank. For the average homeowner, Poulan Pro chainsaws are a good mid-level quality that will get the job done around the yard. Learn more about Poulan Pro Chainsaws or other Poulan Pro lawn and garden equipment by visiting their site.